By James B. Nelson on Monday, November 30th, 2015 at 5:00 a.m.
Those are key numbers as PolitiFact Wisconsin marks a milestone as part of the national PolitiFact network. 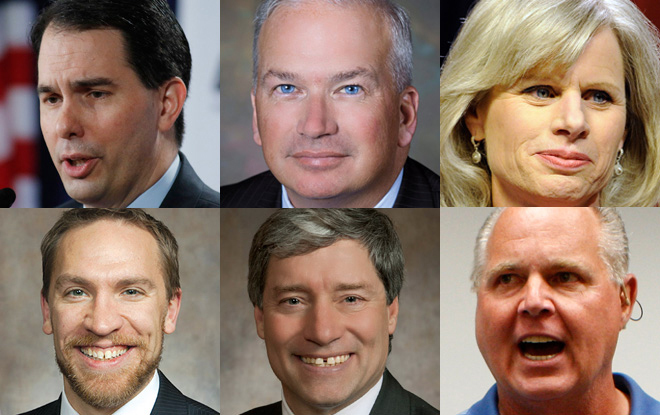 A walk through our archives shows what a remarkable time the past five years have been in Wisconsin politics. When we launched in August 2010, Scott Walker was Milwaukee County Executive. In the time since, he won election for governor three times (once in a historic recall), and waged a brief campaign for the Republican nomination for president. When we started, Democrats controlled the governor’s office and Legislature, only to lose out to Republicans in the 2010 wave. Longtime U.S. Sen. Russ Feingold, a Democrat, also lost his seat that year -- and will try to wrest it back from Republican U.S. Sen. Ron Johnson in 2016. When we started, Johnson was a little-known businessman from Oshkosh. U.S. Rep. Paul Ryan of Janesville went from congressman to the GOP’s vice presidential nominee to, just months ago, House Speaker. All of that and more has provided plenty of fodder for the Truth-O-Meter (and our related Flip-O-Meter). All of the items have one thing in common. They are statements that caught our interest and made us ask: "Really? Is that the case?" A walk through our first 1,000 items provides snapshots into this period of political upheaval and change -- and even a glimpse into the future. Item No. 100: State Sen. Majority Leader Scott Fitzgerald (R-Juneau) said photo ID legislation was needed because there were instances of "people trying to vote five, six times a day." We rated that False -- even Fitzgerald’s office couldn’t provide evidence of a single such example. In the spring of 2011, the Legislature passed and Walker signed a photo ID bill, but court challenges preventing it from taking effect -- so far -- in a state-wide election. The first test is likely to be the April 2016 election. No. 200: In May 2011, Walker claimed Milwaukee County spent more than $170,000 in salaries in 2010 for employees to "participate in union activities such as collective bargaining." The statement rated True -- and then some. The county paid $180,385 to three union presidents who did union work full-time and other employees who did occasional union work -- payments that had been agreed upon in the union contracts. No. 300: State Rep. Brett Hulsey (D-Madison) issued a news release in October 2011 that said Walker’s "actions are directly responsible for killing at least 15,000 jobs." We rated the statement False because there was no evidence anywhere near that many jobs had been cut because of Walker’s actions. No. 400: In May 2012, Walker claimed in a TV ad during the recall election that the state had created 33,200 jobs since he became governor in January 2011. We rated the claim Mostly False. Walker combined two data sets to put the jobs numbers in the best possible light, without any caveat that some of the numbers were preliminary and subject to considerable revision. This mixing and matching of jobs data was persistent, as Walker and his opponents struggled to use little-understood sets of federal and state data to score political points. No. 500: A labor-backed Super PAC claimed former Republican Gov. Tommy G. Thompson, a candidate for U.S. Senate, supported a plan for "privatizing Social Security." We rated the claim False. We could find no evidence that Thompson supported such a plan. No. 600: State Sen. Chris Larson (D-Milwaukee) said in June 2013 that the Wisconsin Economic Development Corp. -- the agency created by Walker and legislative Republicans to boost job creation -- "cannot account for creating one single job." We rated the claim Mostly False. Larson was correct that neither the agency -- nor an audit that was critical of its performance -- could quantify its overall effectiveness. But there were plenty of examples of businesses that had received WEDC assistance and grown. We’re going to hear plenty about Larson and WEDC in the months ahead. Larson is running against Milwaukee County Executive Chris Abele in the spring 2016 election. And even Republican leaders have expressed disappointment with WEDC’s performance. Assembly Speaker Robin Vos recently said lawmakers might try to rebrand and inject more money into the agency in 2016. No. 700: Talk radio heavyweight Rush Limbaugh waded into Wisconsin politics and got his facts wrong. Limbaugh claimed in April 2014 that Wisconsin is "one of the bluest" states, but under Scott Walker its unemployment rate "is around 3.5%." The talker’s statement was False -- both parts of it. Although Wisconsin has voted for the Democratic nominee in the last seven presidential contests, it is far from being an automatic in the Democratic column. And at the time of the claim unemployment in Wisconsin had dropped to near 6 percent, nowhere near 3.5 percent. The current rate is 4.3 percent. No. 800: Democratic challenger Mary Burke in Sept. 2014 claimed that job creation had gotten worse each year that Scott Walker had been governor. The data said that’s not the case. At that point of his first term, the performance had been an up and down one. Employers continued to add jobs, albeit not at a strong pace. We rated the claim False. No. 900: Walker claimed in April 2015 that Wisconsin Democrats controlled both legislative chambers and the governorship "for many years" before 2011. We rated the claim False, since it overstated how long the Democrats had total control in Wisconsin. It was for a two-year period, before Republicans won complete control. No. 1,000: The National Republican Senatorial Committee said in November 2015 that Feingold "wanted to get money out of politics. Now he’s profiting from that same dark money." We rated that claim Half True. Feingold received $59,500 in salary from Progressives United Inc., a non-profit founded by Feingold that is not required to disclose its donors. While it was active, the group voluntarily listed its donors on its website. But those lists are no longer readily accessible, since the group’s website is no longer active.